Lavish property with five bedrooms, private pool, home theatre etc. 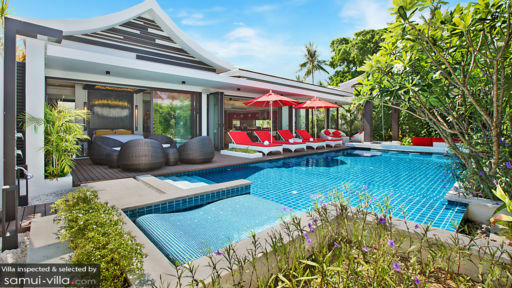 Found near Lamai beach, Villa Julia is a five-bedroom tropical home which overlooks the sea and provides a sanctuary to guests looking for a relaxing holiday. Designed by a French architect, the villa breathes French sophistication interspersed with Thai interiors for a fusion of cultures. 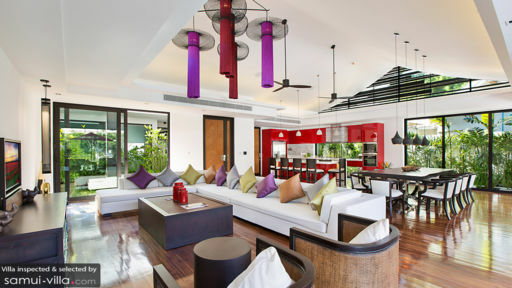 Just 25 meters away from Samui’s many popular beaches, the villa is well-suited for adults and kids alike! Quality amenities and services are provided to guests for a luxurious and memorable experience. Villa Julia boasts of five bedrooms in total, of which two are master bedrooms with king-sized beds and Jacuzzi tubs in their bathrooms. The bedrooms open out to the pool area or a smaller garden where you will find sitting space as well. Some of the bedrooms are furnished with twin-beds and each bedroom is designed with a fabulous ceiling that speaks to traditional Thai elements. Sliding glass doors keep the bedrooms well-lit and ventilated, whereas, the televisions keep you entertained. Each bedroom has an en-suite bathroom that is fitted with either a bathtub or a walk-in shower area, or both! There are necessary amenities and facilities in the bathrooms for guests and their ease. The lavish property is marked by a private swimming pool which is surrounded by lush foliage and dense trees, as well as exotic flowers. Besides the pool, there are sun chairs placed under parasols where guests can sunbathe and relax, a rattan sitting area with circular chairs to enjoy a cup or poolside breakfast. 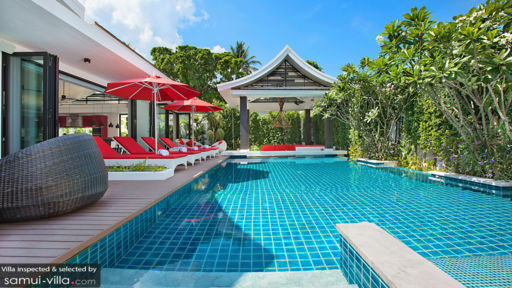 Another lounge area is found beside the pool under a traditional gazebo, for a large gathering as it is fitted with bright red sofas for lounging. The walled gardens provide absolute privacy to guests so they don’t have to worry about their safety. An expansive living area that is fully-furnished and swanky featuring Thai décor and wooden flooring, polished to perfection. The room is found poolside and the large glass walls allow you to enjoy the beautiful view of the pool and gardens from where you sit. There are comfortable and plush sofas and armchairs in the living area, which are placed facing a flat-screen TV so you can enjoy watching some films with your loved one. Villa Julia is a smart house and the functions (music, video, AC, and lights) are all connected via your smartphone. A home theatre projector connects you to a library of blockbuster films and chart-topping music lists. The dining area comprises a 10-seater dining table for guests to dine in style. Overhead lighting adds an opulence to the entire living area and indoor plants keeps the room fresh at all times. Enjoy the fresh breeze through the glass doors, at the same time relax in this air-conditioned space on hotter days. The kitchen is a western, state-of-the-art affair with modern amenities and appliances along with a stylish look done up in red and white. Complete with a breakfast bar, the kitchen is where the chef will delight you with excellent meals! Villa Julia offers its guests a chance to live in the lap of luxury with five-star amenities including a continental breakfast each morning, 24-hour security, daily housekeeping, and staff that will help you plan out your trip. They can arrange for many activities for guests including diving, playing golf, boat tours, car rentals, and baby sitters. You are on one of the popular private beaches of Koh Samui, free to do as you please without any disturbances. Take this time to visit the local temples and do some sightseeing near Lamai. There are many water activities to engage in including deep-sea swimming, boat rides, snorkeling, and scuba diving!